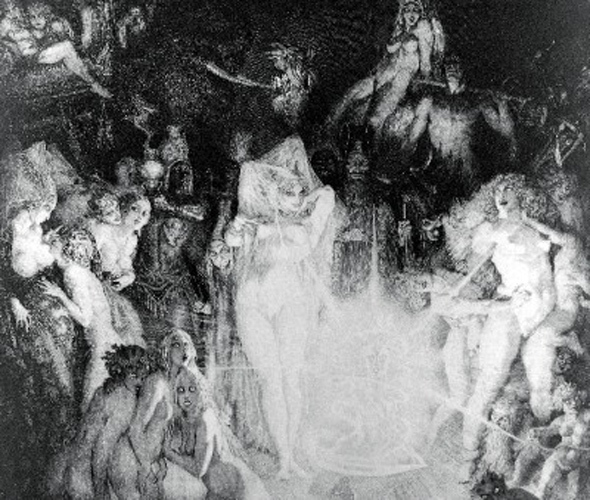 Norman Lindsay Etchings: Reference Catalogue Raisonné 1999, cat.299) Norman’s most celebrated veiled woman is the figure representing life in Enter the Magicians. This central figure was modelled by Rose. The transparent veil indicates life’s eternal enigma and the magicians represent artists, both creative and destructive, revealing all the complexities of human passion. The surrounding figures are the vast panorama of life from which art derives its material. In a letter to publisher Charles Shepherd, Norman wrote in detail about the symbolism in Enter the Magicians and outlined why he was reluctant to explain his work: The Magicians of course, are the artists – the creators, whose function is to create human consciousness by revealing life in all its complexities of human passion to mankind. The figure of Life is still veiled, but the veil is transparent – already art has made its revelation and Life, since Homer made its first analysis, is revealed to us. We know the passions which motivate man, but Life will always be an enigma, and therefore the transparent veil remains. The dignified figure of the magician represents Creative Art – the malicious small Magician represents the destructive element in Art, of which we have plenty of examples with us today. The whirling image of the five pointed star represents fire, the dripping figures emerging from below represent Water, the Salamander and the Naiad – the elemental symbols of the creation of biological life. The strong figure clasping the boy and girl represent the bi-sexual construction of the human entity – half man, half woman. Surrounding all these are just a series of images, suggesting the spectacle of life from which Art draws its material – the Bull with the primitive male figure symbolising the fecundity of life. Technically this etching is a masterpiece. In a long letter to Harry Chaplin about the technicalities of his etchings Norman said: … One’s instrument is the most delicate that ingenuity can devise; the point of a needle. One’s material, copper, offers a surface which can record the most delicate of tones in markings finer than hairs, while it can go to the other extreme in the deepest blacks a pigment may convey. With such a gamut it is impossible not to dream of achieving a technical perfection. … I will go so far as to say that there are two etchings which remain in my mind as having achieved something of what I sought, as against the intensely difficult technical problems they presented. Enter the Magicians is one, and C Sharp Minor Quartet the other.